James Crawford's motor racing career shows remarkable similarities with that of Brian Henton. Both were regarded as extremely talented Brits, both got an early opportunity with Lotus, and both saw their careers falter after that - although many years later they each managed to hit the limelight on occasion: Henton was crowned 1980 European F2 Champion, while Jim Crawford had to save the day once a year in his Menard Lola-Buick. The Menard cars rarely made it to the finish but Crawford was always a star on Pole Day. So what was wrong with Lotus in 1975 and why did Henton and Crawford suddenly get the chance to drive a works Lotus at their home GP? First we need to see Colin Chapman's habit of taking on the patronage of talented British youngsters. To name just one example from each of the decades of F1 Chapman lived to see: Stacey, Spence, Evans, Mansell. It was his weak spot and for 1975 he invited Brian Henton and Jim Crawford to become test driver. With the ancient 72 still running there was a lot of work to be done to keep the old beast at the front of the grid. Apart from the D and E versions run in 1975 one special development was a coil spring rear-suspended version, designated 72F. The Hethel outfit, now a shadow of its former glorious self, had to extract every last drop of developmental nectar out of the ageing 72 because the proposed successor, the 76, proved a disaster in 1974, with the 77 still in an embryonic state on the drawing board. So from the onset this was clearly an in-between season. The plan was for test driver Henton to debut the F as the traditional third entry for the British GP. This happened alright but there was another new face on the Silverstone grid that year. It belonged to Jim Crawford, the Scotsman entrusted with the second car, a regular E version, after a disillusioned Jacky Ickx had left the team. Lotus now had hit rock bottom, the all-star line-up of Peterson and Ickx obliged to plug away with an increasingly less competitive pair of long-wheelbase 72Es. The two rarely featured and only seldom managed to convert their mid-grid starting positions into something to write home about. Ickx's second place in the freak Spanish GP was one but the attrition rate had been literally killing. At Monaco, Peterson managed to salvage some points, as he invariably did at the street venue, but usually he was a lapped finisher, never even close to the top six. With a meagre nine points in the bag for the constructor's table and yet another retirement for Ickx in France, the Belgian packed in his lot to move to sportscar pastures new. Still, F Atlantic is hardly F1 and thus, in his natural progression as a driver, F1 just came too quickly, too soon. For 1976, the projected F2 ride fell through and in 1979 he was still dabbling in F3 and F Atlantic, the Atlantic veteran returning to his winning ways with five race wins and another runner-up position in the championship. The Aurora AFX series stood at the basis of a short resurgence, Jim winning the 1980 F2 class in a Chevron (with an surprise outright win at a wet Oulton Park), which led to a full F2 campaign in 1981, ironically in the ex-Henton Toleman TG280B. This also proved fruitless, and after claiming the final "British F1" title in 1982 in an AMCO Ensign, Crawford decided to try and find better luck in the United States. In 1983 and '84 he made a name for himself in CanAm racing (adding another two championship runner-up spots to his tally) when the series was already beginning to falter. 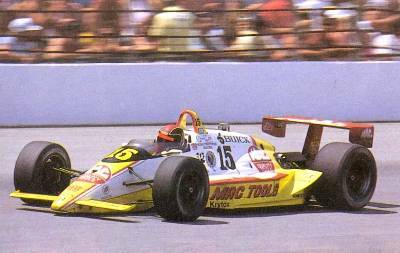 He then moved camp to Indycars, becoming a Month-of-May wonder for John Menard's Buick-powered outfit. For seemingly endless years the annual Indy 500 became Crawford's only race of the season, Jim faithfully sticking with Buick's stockblock pushrod engine that was eligible only for the USAC-sanctioned classic. The Menard team was the most prominent advocate of the Buick powerplant and regularly managed to upset the CART regulars, for instance when Scott Brayton took pole in 1996 before fatally crashing the day after. 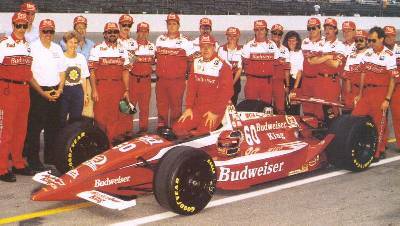 Although the Buicks were known for not lasting the distance Jim's best result came in 1988 in year-old Lola-Buick T87/01, finishing 6th. This was a startling performance as Jim was still walking with a cane after a 12-month rehab from a huge practice smash in 1987 that broke both his feet. In 1990 his Lola-Buick T89/01 again reached the chequered flag but this time he finished a lowly 15th. He had another eventful qualifying day when he wiped out this Lola T89/01 in a violent crash: coming off the wall his Lola got airborne as high as 6 meters before coming down to terra firma again. This time Jim escaped without injury. For 1991 he got his hands on a brand new Lola T91/01, again with V6 pushrod Buick power behind him, but it ended after 40 laps when the fragile Buick let go again. For 1993 he abandoned the trusty Buick for an Ilmor Chevy in his new T93/01. In his last Indy 500 race he finished a poor 24th. For both 1994 and 1995 he failed to get his car up to speed and didn't qualify. 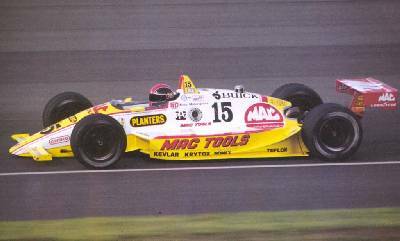 His 1994 DNQ came as no surprise however, as he was fielded in an ageing Buick-powered T92/01. The old Lola was just too slow, reaching a mere 217mph. Over 220mph was needed to qualify. In 1995, now at age 47, he did his final attempt in a year-old Reynard 94I-Ford XB. 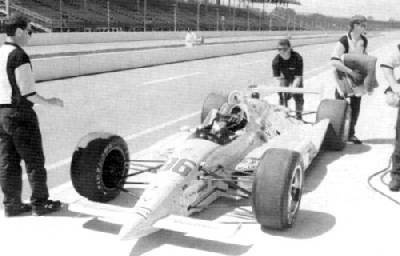 In 1999 Jim Crawford worked as a car development consultant for IRL outfit Brant Racing, bringing valuable knowledge of Indy racing to driver Andy Michner and his Riley & Scott MkV. The early 1970's were a funny time for F1 and for racing in general. The accountants were beginning to see the benefits and the whole scene was growing increasingly commercial and yet teams were still willing to give a grubby mechanic a crack at a racing car. That's what happened with Jim Crawford. He began his career as a mechanic but soon proved as quick as the drivers he worked for. As a result he got a chance to drive a works Chevron for Derek Bennett Racing back in 1973. By 1974 the quietly spoken Scotsman had shown a lot of potential and had only narrowly missed out on the Formula Atlantic title. 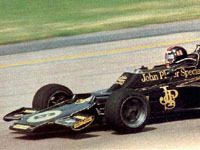 It was his performance in that series that earned Crawford a testing contract with Lotus for 1975. That contract turned into a shot at racing at Silverstone for the 1975 British Grand Prix. Following the previous race - France - Jacky Ickx and Colin Chapman had decided to part company. Ickx - in my opinion one of the best drivers never to have won the championship - had spent 1974 switching between the ageing Lotus 72E and the undriveable type 76. 1975 had not been much better, hence the parting of the ways. That left a vacant slot for the British race and test driver Crawford got the call along with Henton who ran in the third machine Colin liked to field for his home races. The 1975 Silverstone race is significant for a number of reasons. One (and most importantly) it was the very first race I attended as a young and very excited schoolboy, Woodcote had its new chicane, built in response to Scheckter's fracas two years previous and it was also the scene of one of the most impressive accidents ever seen in F1. The race began fairly dry and apart from a brief shower the weather held until 11 laps from the end. At that moment all the rain in the world fell onto the track in a downpour of biblical proportions (I know, as I distincly remember not having an umbrella and squeezing water out of my wooly jumper when it finally stopped!). Between Stowe and Club corners a dozen drivers ploughed into the catch fencing. Brise was the first to bury his machine in the scenery and he was lucky not to be hurt when a fence-post knocked his helmet off before leaving him unconscious. A marshal went to his aid and was immediately knocked down - suffering broken bones - as Scheckter, Pace, Morgan, Nicholson, Donohue, Mass, Watson and Patrick Depailler all crashed into the same section of fencing. 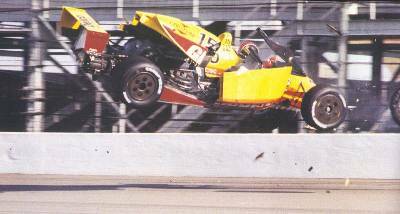 Somehow Fittipaldi held it together and led just five cars home. The red flag was thrown and the stewards rightly determined that the result should be based on the runners at the end of the lap before the accident. That bought Scheckter and Pace a podium place each. As for our hero, Jimmy had spun off several laps earlier having never really got to grips with the field. Jimmy got another crack at the Lotus two races later at Monza and although he finished in 13th place he was 6 laps behind the leaders and out of a job. For 1976 Crawford had lined up a ride in the F2 series but that fell through at the last minute and he was forced to wait for a British F3 drive in 1978 where he finished in a lowly 21st position. 1979 saw him back in Formula Atlantic before he took a Chevron to the title of the F2 class in the British Aurora F1 series. He repeated the feat in 1982 with an unproductive season in F2 in between. 1983 saw Jimmy looking across the pond to the USA where he secured a drive in the Canadian-American Challenge Cup with Ensign. He finished fifth in the series 1983 saw him competing in the Thundersports series and Can-Am where he scored two wins and a second place in the championship. For 1984 he switched to a March chassis and bagged three wins but still only finished second in the series. That led to a series of drives in the Indy series and some fine runs, especially at Indianapolis where he finished 6th in 1988. Thus ends the tale of yet another of F1's forgotten men.